Marinate chicken with bitter orange juice, garlic, onion and bell pepper in the refrigerator for at least one hour. Heat oil in large skillet and brown chicken. Add citrus juice, onion and bell pepper and let cook down slightly. Add tomato sauce, cooking wine, olives and dried seasonings. Stir frequently to incorporate flavors and simmer for 5 minutes. Add potatoes and cover with water as needed. Cook on low medium heat for approximately 30 minutes or until chicken is cooked through and potatoes are soft. Throw your ingredients in a slow cooker in the morning to enjoy this classic Cuban meal for dinner! 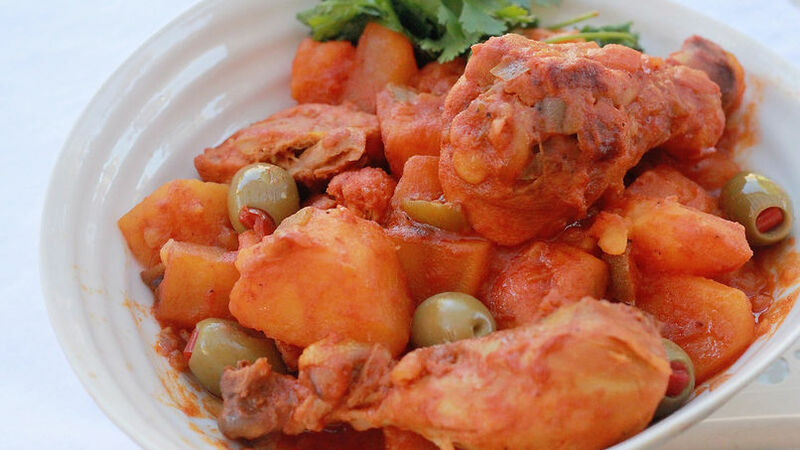 A traditional Cuban meal, Chicken Fricassee was a staple of my childhood food culture. Made of whatever chicken pieces available, coupled with chunks of smooth potatoes, Fricassee is an affordable meal that can feed a large crowd. But don’t let this meal fool you; Chicken Fricassee will fill your home with the warmth of dried herbs and the hearts of your family with the love of a slow cooked meal.